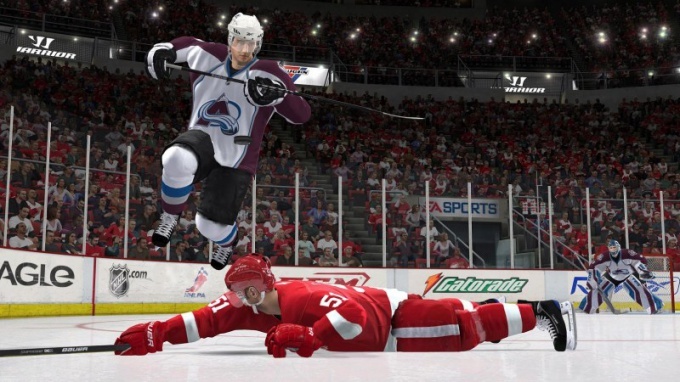 NHL, is the best hockey simulator. Millions of fans of the game on the ice fighting with the computer and with each other on consoles, computers and mobile devices. Use tricks allows you to beat defenders and score a goal virtually unchallenged. The trick in sports is an unusual technique that at the expense of surprise and break the pattern to confuse the opponent, to obtain a competitive advantage and implement it (to score, to throw, etc.). The trick in games NHL - key combination that allows you to beat the enemy and score a goal or start of a spectacular attack. The division of feints can be done at preset (standard, a standard developed by the creators of NHL) and exclusive, coined by the Top players in online leagues. On the keyboard the number of tricks is limited. Gamepads and joysticks can significantly expand the Arsenal of cyber-athlete. The gaming input devices can be divided into two large groups: with "off" without them. Kuroki, often called "analogs" to give direction to the putter during the impact, use more flexible techniques. Starting with version NHL09 players available pretty simple but useful technique Push Pack ("Push"). During execution, the puck flies forward, the player attacks your team, and the club is making a false movement to the side, confusing the defenders of the enemy. Press Tab + S on the keyboard; use the "square" and the double movement triggers "left and right. Or top hold down additional keys with O on the joystick of the old model (without parallel). Beautiful feint "spinner", "turn" allows you to cover the puck with the body and hard to break through on goal after a 360 degree rotation around its axis. Key a key on the keyboard in the simulator NHL05-NHL08 - S, on the controller without triggers - double tap on O, Kurki - circular movement of both analogues at the same time. In later versions the value of a feint on the joystick remained on the keyboard requires pressing Tab and A spectacular reception. There is a kind of "feints" used in the defense, and not in the possession of the puck. Their goal is the selection, or saving the gate from attacking the opponent. Tab + E on the keyboard, the triangle with the movement of the right trigger in the direction of the player with the puck (or a triangle with two lower keys) will enable the defender of your team to fall in the literal meaning "to claw" game shell with a stick. Defensive strategies can be viewed in the menu "Settings management" of his version of the NHL. Use them in the minority, tends to equal the account or the retention of the "status quo" with a goal advantage.